Infiltrate Cad Bane’s crew and uncover his evil plans with Obi-Wan Kenobi in his Rako Hardeen bounty hunter disguise! Go after Cad Bane in the single-seat HH-87 Starhopper™ with an opening cockpit for Obi-Wan, 4 flick missiles and pirate speeder! Make a smooth landing with the folding wings and find out what he’s up to! Includes 3 minifigures with weapons: Obi-Wan in Rako Hardeen disguise, Cad Bane and a Nikto guard. This comes down to 16.56 cent per brick. The HH-87 Starhopper™ (75024) Lego set is no longer directly available from the sites below. However, 3rd party partners of these sites might still have the set available. 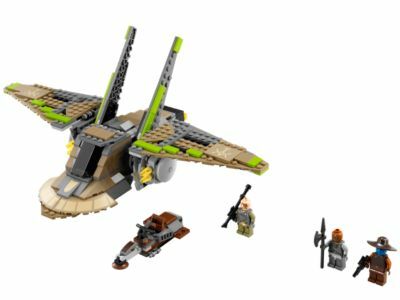 Lego Star Wars 75024 - Navicella spaziale HH-87 Starhopper, serie "Guerre stellari"
Alternate description Go after Cad Bane in the LEGO® Star Wars™ HH-87 Starhopper™ with opening cockpit, 4 flick missiles, cool folding wings and pirate speeder!